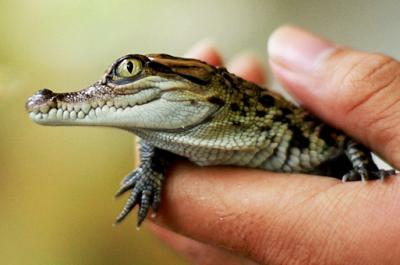 Twenty critically endangered Siamese crocodiles have hatched in a zoo in Lao PDR, representing a significant step in the successful conservation of this species. The Siamese crocodile eggs were found in June, floating in a bed of reeds on a lake in Laos' Savannakhet Province, and were brought to a zoo for protection. Working with the Lao PDR government, the Wildlife Conservation Society (WCS) helped to successfully hatch the clutch of these rare crocodiles. The successful hatching was part of the Crocodile Resource Management Plan, which uses crocodile conservation to protect the valuable wetland habitat found in Savannakhet Province. As part of this, eggs from wild nests are incubated in captivity, in order to boost the number of individual crocodiles that survive. In their first year, juvenile Siamese crocodiles are particularly vulnerable to predation. WCS have relied heavily on the support of local communities to promote conservation of the Siamese crocodile, which has the added benefit of aiding the recovery of its wetland habitat, upon which many local people rely for their livelihood. "We're thrilled at the prospect of augmenting the wild population of Siamese crocodiles with a new batch of healthy juveniles," said Chris Hallam, Conservation Planning Advisor for the Wildlife Conservation Society's Lao PDR Program and the crocodile project coordinator. "It's a small but important step in helping to conserve a valuable part of the natural heritage of Lao PDR for the benefit of future generations." Once thought to be extinct in the wild, Siamese crocodiles are severely threatened across their whole range in South East Asia by hunting and habitat loss. Although the Siamese crocodile can grow up to 3 metres in length, it is generally docile, making them unfortunately easy to hunt. Scientists now think there could be as few as 300 of them living in the wild. These young crocodiles will be released into the wild in around 18 months, once they are large enough to fend off any potential predators, a great achievement in the ongoing rehabilitation of this rare species.